Since my last report published on 17th May (apologies for the delay in getting this one out), global equities have declined -1.1% in euro terms, Eurozone government bonds have rallied +0.4% and gold priced in euros has fallen -4.8%. Currency moves have negatively impacted Active Asset Allocator returns in recent months with the USD falling -6% and GBP falling 4% versus the Euro during that time. All is not lost however and this month I highlight my bullish expectations for precious metals for the second half of 2017 and beyond. I think gold is on the cusp of a significant move higher. This month I also review Bob Farrell's 10 rules of investing and discuss how they apply to the markets (particularly the stock market) today. Farrell is a stock market veteran who cut his teeth on Wall Street during the 1950's and experienced many of the equity booms and busts that followed over the next five decades. Farrell crafted his 10 rules of investing based on those experiences and lessons learned. For now, I remain defensively positioned in the Active Asset Allocator with 20% equities / 40% bonds / 30% precious metals / 10% cash. Gold Trader Trade 14 (-2.6%) and Trade 15 (+0.6%) closed in July. Trade 16 is open and +1% so far. Click here to view the August 2017 Investor Letter. I was reminded recently of Bob Farrell and his 10 rules of investing, wisdom he accumulated over an illustrious career on Wall Street spanning five decades. Farrell joined Merrill Lynch in 1957 as a technical analyst after completing a Masters degree at Columbia Business School where he studied under Benjamin Graham and David Dodd, authors of the investment bible 'Security Analysis'. Farrell witnessed many bull and bear markets throughout his career and crafted his 10 rules of investing based on those experiences and lessons learned. This month, I review Farrell's 10 rules and see how they apply to markets today. 1: Markets tend to return to the mean over time. Trends in one direction or another eventually exhaust themselves and price moves back to test the long-term moving average. This generally happens every few years. 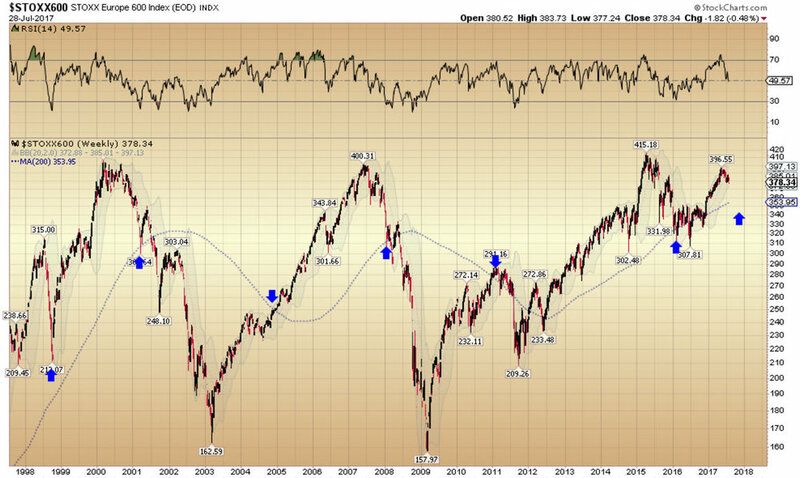 The epic bull run in stock markets has swung from oversold in 2009 to overbought today. Even in strong bull markets, investors should expect the long-term moving average to be tested every couple of years. Today, the S&P 500 is 20% above its long-term moving average, while the Eurostoxx 600 is 7% above its long-term trend. 2: Excesses in one direction will lead to an opposite excess in the other direction. Markets that overshoot on the upside will also overshoot on the downside. The New York Stock Exchange publishes data for margin debt at the end of each month. Margin debt represents the extent to which investors borrow to invest in the stock market. Bull markets breed (over)confidence and confident investors borrow to invest in the stock market. Margin debt surged on three occasions since 1995 coinciding with the last three bull market peaks. Today, NYSE margin debt has never been higher. Ever! 3: There are no new eras – excesses are never permanent. There are always hot stocks and sectors of the market that attract speculative capital. Some lead to speculative bubbles but they never last. Today, internet sensations Facebook, Amazon, Netflix, Google and the cryptocurrencies Bitcoin and Ethereum fall into this category. They are attracting a lot of hot money but chasers will be punished, eventually. It always happens. 4: Exponential rapidly rising or falling markets usually go further than you think, but they do not correct by going sideways. Bullish and bearish trends generally last longer than expected. However once the trends end, they are followed by sharp reversals. The Shanghai Stock Exchange Composite and Nasdaq 100 indices are two examples of exponentially rising stock markets followed by sharp reversals. In China, this occurred in 2008 and again in 2015. In the US, the Nasdaq bubble popped in 2001 and again in 2008. Another appears not too far away. 5: The public buys the most at the top and the least at the bottom. The average investor is most bullish at market tops and most bearish at market bottoms. When the marginal buyer turns into the marginal seller, a bear market begins and endures until panic sets in, the speculative buyers have been forced to sell and investor sentiment turns pessimistic. This roller coaster of sentiment and emotion is what defines a market. 6: Fear and greed are stronger than long-term resolve. Human emotion is the enemy when it comes to investing in the stock market. Successful investing requires discipline, patience and a cool head. Sharp declines lead to fear; sharp rallies lead to overconfidence and investor complacency. The Vix index is an excellent barometer that captures fear and greed in the stock market. Low readings in the Vix Index go hand in hand with investor confidence and limited demand for insurance to hedge against stock market declines. Spikes in the Vix Index coincide with periods of sharp selling in the stock market as panic sets in. Today, the Vix index is trading near ALL TIME LOWS. 7: Markets are strongest when they are broad and weakest when they narrow to a handful of blue-chip names. Stock market breadth and volume are important indicators of underlying strength of a stock market advance. When participation is broad, stock market rallies have endurance and momentum and are difficult to stop. When participation is confined to just a few large-cap stocks, rallies have less credibility, momentum and strength. Today, stock market breadth remains quite firm. The Advance/Decline line (lower left chart) continues to make new highs, signalling that the majority of stocks remain in an uptrend. However, initial signs of deterioration are showing up in the number of net new highs being made on the NYSE. This occurred just prior to every correction in the past. 8: Bear markets have three stages – sharp down, reflexive rebound and a drawn-out fundamental downtrend. The typical pattern in a bear market decline involves a sharp sell-off, an equally sharp reversal higher and then a long, slow grind lower until valuations become compelling once again. The reflexive rebound separating each decline is designed to keep the believers invested and encourage 'falling knife' catchers. 9: When all the experts and forecasts agree – something else is going to happen. If everyone's optimistic, there is nobody left to buy. Excessive bullish sentiment can be damaging to your financial health. If often pays to adopt a contrarian investment strategy and take a more defensive position when the herd becomes overly confident about the market's future prospects. 10: Bull markets are more fun than bear markets. This is true for most investors and fund managers who have long-only investment mandates and are typically fully invested all the time. 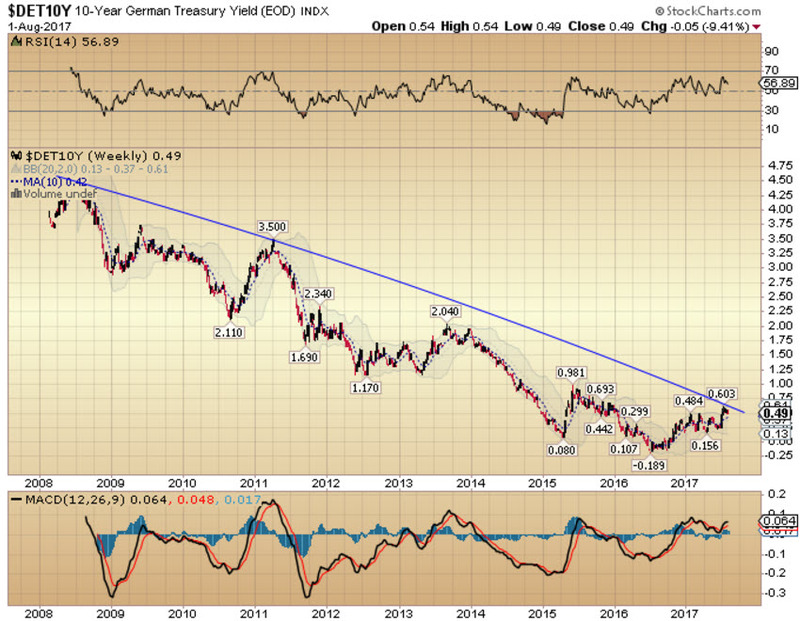 German 10-year bond yields have rallied 6 basis points since my last report while US 10-year treasury yields have fallen 7 basis points. 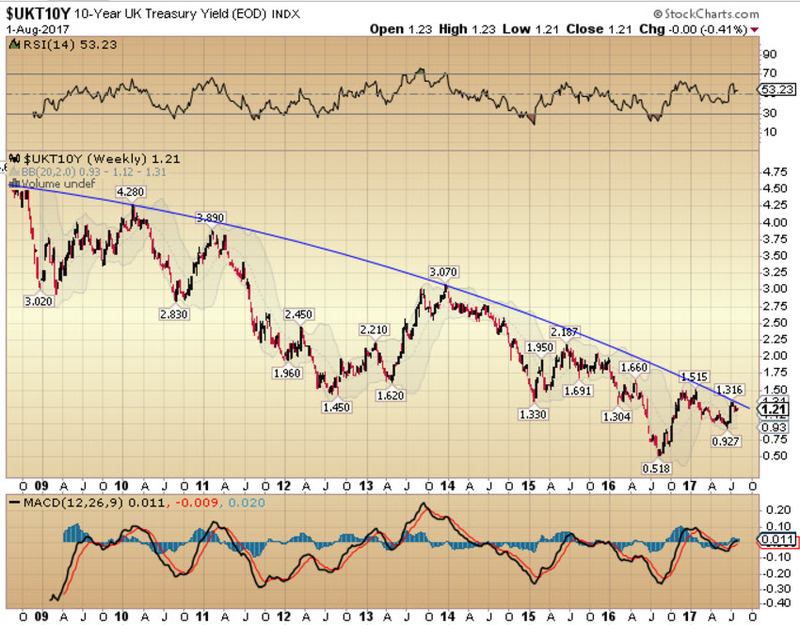 Bonds continue to hold their own and are preparing for their next leg higher (and lower in yields) as the bull market in equities finally rolls over and a sharp equity bear market begins. 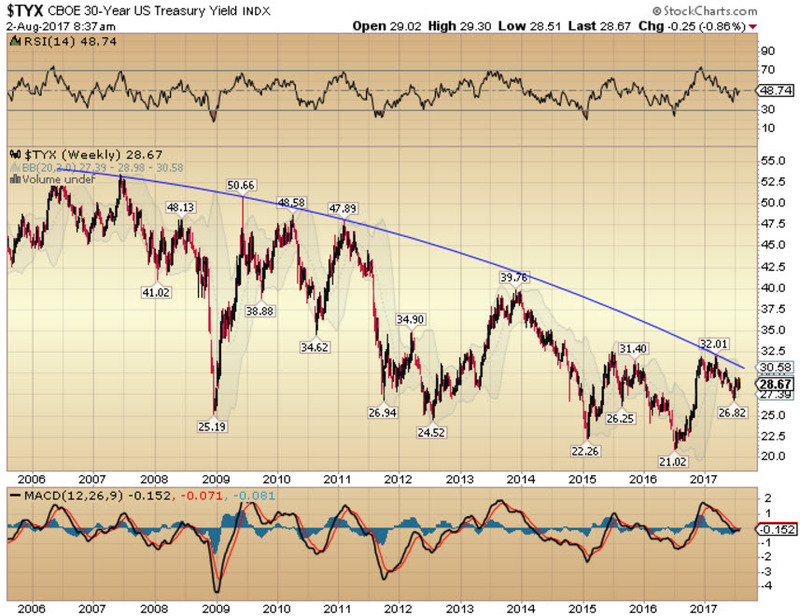 The secular low in bond yields still lies somewhere in the future. 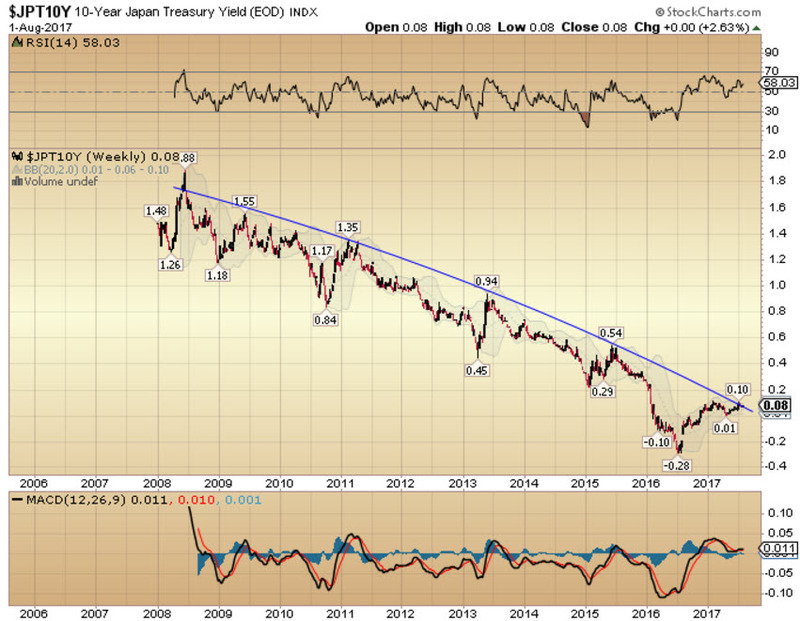 Meanwhile, the trend in inflation-linked bonds remains steadily higher, albeit at a relatively modest pace. Currency has impacted euro-denominated returns in 2017 YTD, as weakness in GBP and USD in particular have not fed through to higher inflation-linked bond prices in local currency terms. A weakening currency will lead to rising input costs, particularly in a country like the US, which is the world's second largest importer of goods and services ($2.7 trillion in 2016). Rising input costs are inflationary. I expect the inflation-linked bond allocation in the Active Asset Allocator to make a more meaningful contribution to performance over the next few years. Gold is setting up for a big move, so let me lay out my expectations for what I believe will happen over the remainder of 2017 and beyond. Gold's first task is to break above $1,300, which I expect will happen in August or September. A break above $1,300 would be significant for a number of reasons. Gold made a series of higher lows in 2017 since the washout decline to $1,124 in December 2016. Gold trading above $1,300 adds support to the view that the bear market in precious metals (2011-2016) has ended and a new bull market has begun confirmed by a rising trend in the gold price. A break above $1,300 would also be significant as it would confirm a break out of the longer-term triangle consolidation that has been in place since gold topped at $1,923 in 2011. Once we get a good close above $1,300, I expect a sharp run higher towards $1,400 or $1,500 before the next consolidation. $1,500 represented strong support in 2011 and 2012 before it gave way in 2013, so I expect gold will take some time to get back above that level. After $1,500, I expect gold will challenge and ultimately exceed the all time highs above $1,900, probably in 2019. Once gold clears $1,900, I believe the bubble phase in precious metals will begin and gold will have a monster move higher in an epic bull market that will be a sight to behold..... but let's not get ahead of ourselves. $1,300 in August/September, $1,400-$1,500 by year-end and $1,900 in 2019, which is 50% above today's gold price. I expect the bull market in precious metals will go hand in hand with a currency crisis in the world's reserve currency, the US dollar. I have shown the following chart on a number of occasions in previous reports. It is a chart of the USD Index from 1980 to today (red and black line) and USD gold (blue). The USD Index has made a series of lower highs and lower lows over the last 37 years. After it's run higher in 2014/2015, the USD Index appears now to have topped and started another multi-year decline, which should ultimately break to new all time lows in the years ahead.